There is a saying coined by a famous Mongolian author and iconic character in his own right: "As far as bad neighbors are concerned, Mongolia is very fortunate." Obviously, Baabar was referring to Russia and China which virtually surround the country. On July 11, 2017, Khaltmaa Battulga of the Democratic Party (DP) was sworn in as President of Mongolia succeeding outgoing President Tsakhiagiin Elbegdorj, who was ineligible for election having served two consecutive terms. Both gentlemen are known to the author. My close friend EB is on the right in the white traditional Mongolian deel. Battulga is best known for his past as a famous wrestler and the wealth he amassed in the early days following the flight of Mongolia from the dominance of the former Soviet Union. He was quite adept in moving goods from abroad into Mongolia, not unlike the pattern established by Joseph Patrick Kennedy, Sr. in the U.S. during prohibition. In fact, in the early 1990's, we practically lived in the Bayangol Hotel owned by Battulga and drank with his "gang" of merry men in the Casablanca bar and restaurant. Beginning with clever import techniques, Battulga moved on and prospered in the privatization process of state properties. He was the first, and perhaps only Mongolian, to ever import black Hummer vehicles for his personal use as they made a statement. His favorite movie was The Godfather which became his nickname. 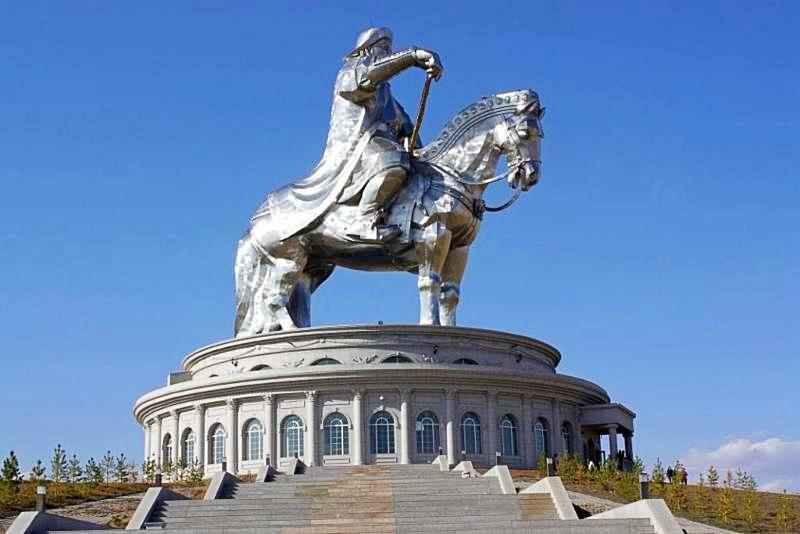 Battulga is also well known as the brains behind the 40-meter tall stainless-steel statue of Genghis Khan on horseback located on the bank of the Tuul River where legend has it Genghis Khan found a golden whip. One year ago, the Mongolian People's Party (MPP) ousted the Democratic controlled parliament of Mongolia to seize absolute control. Although the MPP made great strides with IMF assistance to correct the Democratic mismanaged economy, more than one year is needed to overcome years of mismanaged natural resource development and destructive populism policies. Clearly, the MPP promised more than could be accomplished in one short year. 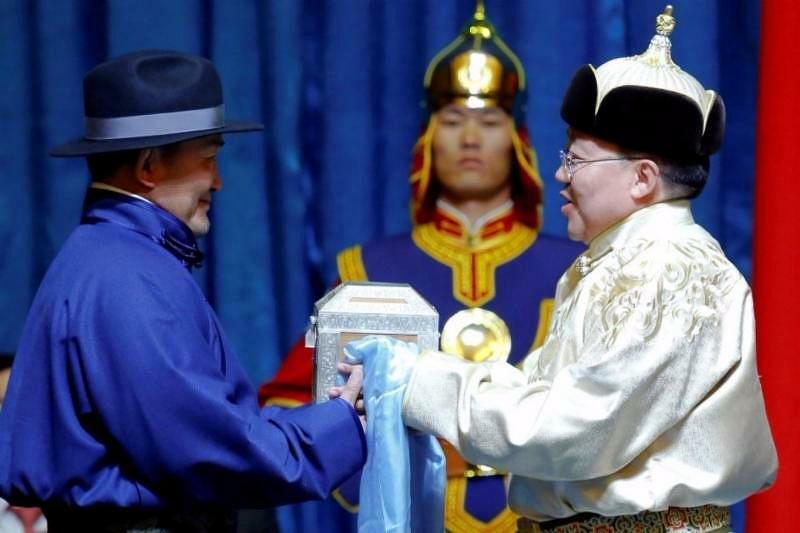 The campaign that preceded the narrow victory of Battulga, with 50.6% of the presidential vote, was the dirtiest campaign in Mongolia's history with allegations of fraud and purported false portrayals of MPP corruption tactics. Shown below is Battulga on the campaign trail in a svelte double- breasted suit. You may recall from an earlier blog that the MPP turned their back on the Dalai Lama following a Chinese complaint regarding Mongolia granting the Dalai Lama admission to Mongolia. In fact, the Dalai Lama in his congratulatory letter to Battulga said, "Mongolian people no longer rely on blind faith but as 21st century Buddhists, they have established their faith on understanding." Clearly, Putin is reveling in the defeat of the MPP presidential candidate, Miyegombo Enkhbold. Therein is the balancing act between the two bad neighbors, Russia and China. On the other hand, there are many other consequences. Once again, populism has raised its ugly head by the Democrats though the MPP had made strides over the past year in an IMF bail-out of massive state indebtedness following years of Democratic mistakes. Nonetheless, the reality is that without parliament support, there is no role for the president other than to use his veto as a member of the three-member National Security Council and thwart any legislation put forward by the MPP. The result will be economic stagnation and gridlock. A new term for the political setting in Mongolia was created which is MAHAH in Cyrillic. MAH is the symbol of the MPP and AH for the Democratic Party. When combined, MAHAH means "fog." Maybe that is not unlike the current environment of "Foggy Bottom" in Washington that has spread to the White House and the Hill. Clearly, like other parts of the world, it is apparent that Mongolians have lost confidence in their existing political parties and traditional politicians. China congratulated Battulga but criticized irresponsible remarks made during the election process. Putin, on the other hand, quietly beamed over what was a clear win for Russia. Maybe Mongolia is not as distant from the rest of the world as most Americans might think. Manop Rachote, one of the leading designers in Bangkok, Thailand, has created a line of Mongolian Gobi cashmere throws for The Elephant Story. 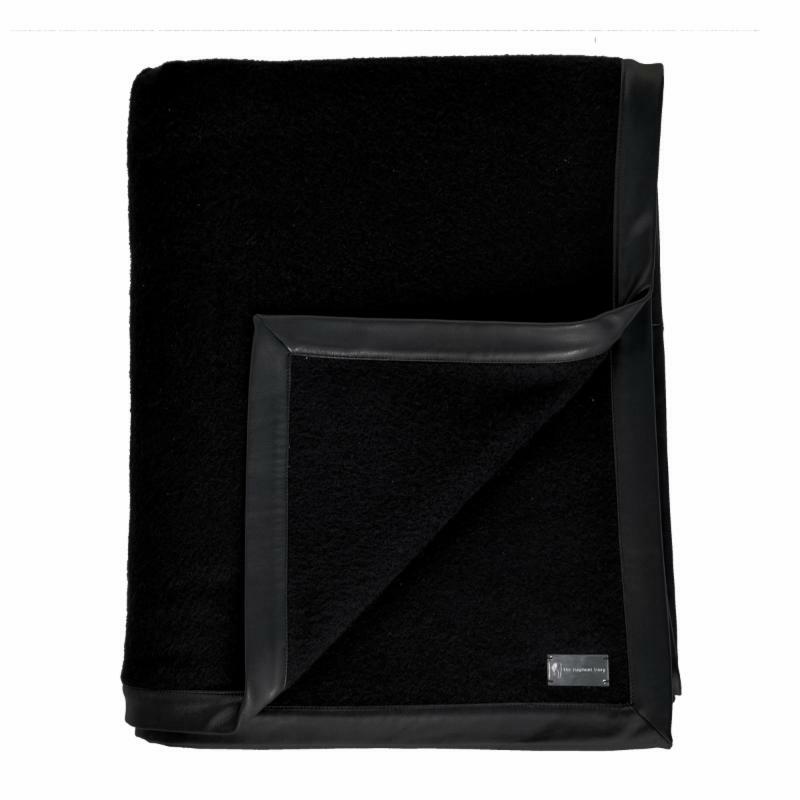 The throws are made from notably some of the best cashmere in the world. 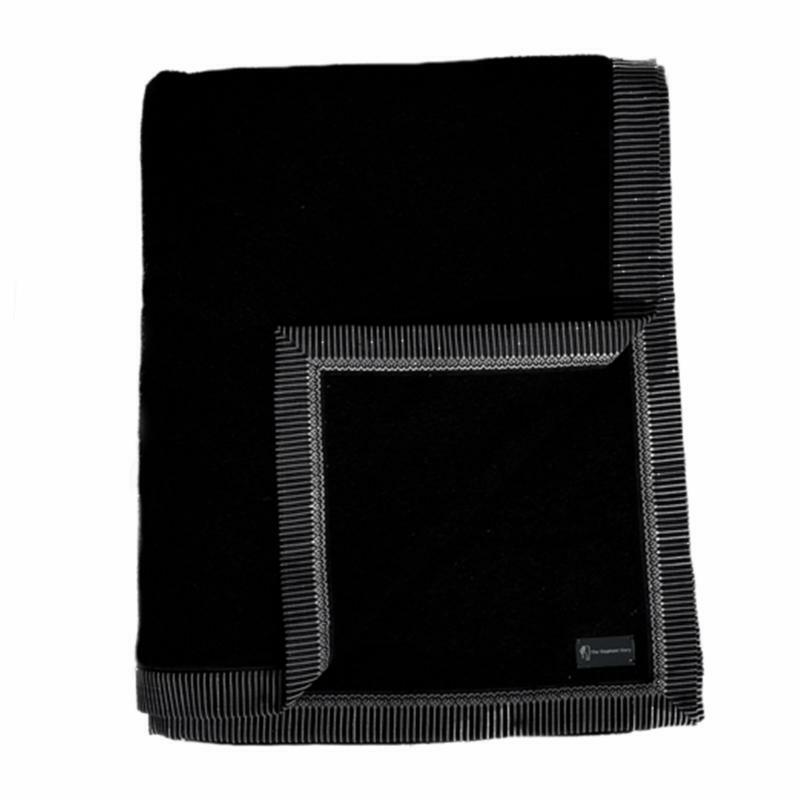 We offer throw choices with a 1-inch border in Kid Goat Leather, Thai Eel Skin or Woven Laos Silk by Carol Cassidy.